The BEST, roasted, homemade breakfast potatoes! These are even better than your favorite restaurant style roasted potatoes! 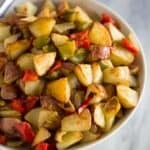 In a large bowl, toss together the potatoes, garlic, onion, green bell pepper, red bell pepper, olive oil, butter, seasoned salt, cayenne pepper and salt and pepper. Pour potatoes onto a rimmed baking sheet. Bake for 15-20 minutes, tossing twice during baking. Raise the heat to 500 degrees and bake until crispy, about 10-15 more minutes, tossing twice.